Check out this article! A spring glimpse into the lives of Niagara’s Song Dogs. 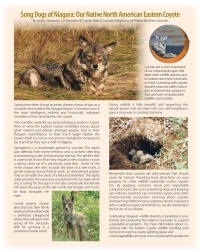 Thank you community neighbour, Walker Brothers Quarries for featuring coyotes in your newsletter! CORNWALL UPDATE: Stay Calm, Press On and most of all…Remain Kind. 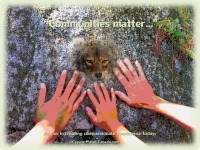 “CORNWALL…Will you become the next leader for a Compassionate Wildlife Community?” We are hopeful that council will consider a reprieve for the Eamers Corners coyote(s) for the time being. We look forward to a potential visit with the community and providing non-lethal successful solutions for the residents there. Residents of Eamers Corners in Cornwall, Ontario have petitioned the municipality to grant trapping as a means to kill coyotes. Many of the signatures are essentially from the same ten to twelve households. What is the true status of coyotes allegedly living in Eamers Corners? The City of Hamilton Animal Services and the Hamilton-Burlington SPCA are co-hosting a Cat Registration and Microchip Clinic. 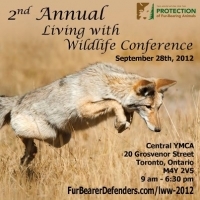 Join us on September 28th, 2012 for our Living with Wildlife event. Featured Guest Blogger: Award Winning Investigative Journalist Michael Howie "How I Learned To Listen"
By Michael Howie Coyotes have been a part of my community for generations. But for most of that time, they were unseen, and rarely heard. In the last few years, sightings began. SPRING 2012 CWC has recently added two new coyote coexistence documents to our education tool kit. We are excited about our Coyote Watch Canada Pamphlet which is now available on the City of Niagara Falls website. Is It Possible To Change Coyotes? For the last seventeen months throughout Niagara, Coyote Watch Canada (CWC) and several very enthusiastic volunteers and residents have been diligently hazing coyotes to discourage them away from feeding “hot spots”. To date, there are many happy and relieved faces that reflect the positive results of hazing our local Song Dogs. Nurturing Compassion For Nature: Is It At-Risk? “Perhaps we’ve already “run out of world” including wildness. Some go as far to argue we’ve created a world that’s so technologically and socially complex we can’t control it”. Dr. Marc Bekoff echoed these words in his article, Wild Hearts. Is our disconnect with nature happening all too swiftly?